HE HAD been rehearsing the church nativity play for a month. That Sunday morning, just five days before Christmas, Bangoang Tut performed the part of King Herod with all the mischief that a six-year-old can muster for such an occasion. Yesterday, at the same Lutheran church in Traralgon, they came together again for a sombre event - Bangoang's funeral. This was one of life's family tragedies, perhaps all the more so because it happened at Christmas. On December 20, the day he performed in the play, the prep school student from Morwell was killed while playing on the front lawn at home when a car ploughed through the fence. Gary Edward Ryan, 25, has been charged with culpable driving over the death and is on remand. In a church service delivered in English and the Nuer language, denoting Bangoang's family origins in southern Sudan, more than 400 mourners yesterday paid their respects to a young life lost. It was a life that seemed to hold so much possibility in this new land of opportunity. Bangoang's parents, Jacob Bangoang and Yomding Deng, had found refuge in Australia in April 2005 when their eldest son was aged just two. As a family they had been victims of one of the cruellest outbreaks of civil war in contemporary African history. But their situation had dramatically improved since resettling in Australia. Victoria - they had lived in Dandenong before moving to Morwell in 2007 - seemed to offer a haven. The move to Morwell had been significant, said Thenken Tuany, an uncle, who delivered a eulogy on behalf of the tearful family. Bangoang's parents have two younger boys, Joshua and Mal, and are expecting another child next year. ''The family decided to move to the country town of Morwell in search of better opportunities for their children and job prospects,'' Mr Tuany said. Indeed, Mr Bangoang had made real inroads, having secured employment as a security guard, and more recently, working for his church in a paid position. A devout Lutheran, he had undertaken seminary courses in Adelaide and was a well-liked leader in the small Sudanese Christian community in Gippsland. 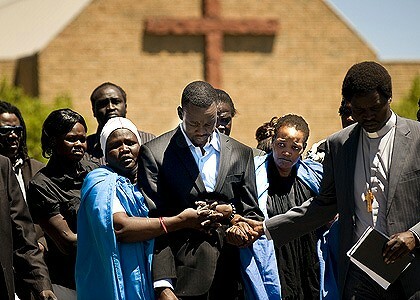 Since Bangoang's death, more than 200 members of the Australian-Sudanese community have visited the family home to offer their support. Many were present in the pews yesterday, singing gospel-like songs of praise in the Nuer language. In this dark moment, the devotion offered further comfort to the family. SUDAN: Bol Manyiel, "I can still buy more guns with my remaining cattle"